Official laboratory test reports are issued within 24 hours of site test completion. 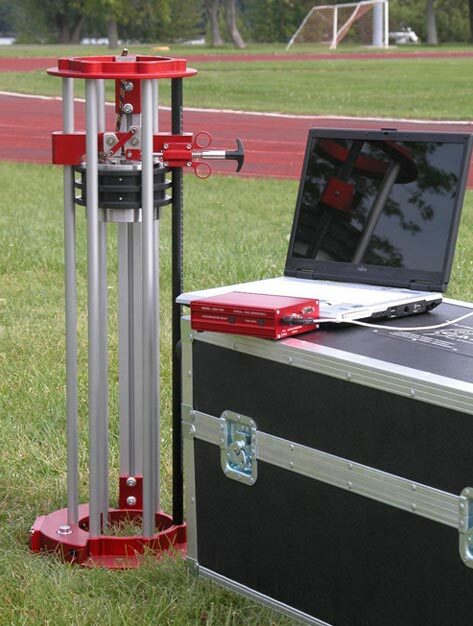 Gmax testing measures the shock attenuation performance of a sports surface. Our specialist equipment can be used on both natural or artificial turf surfaces. G-max testing refers to a result in gravities which is the ratio of the maximum acceleration/deceleration that is experienced during an impact. A high result means that a surface has low shock attenuation characteristics. The tolerance for results are specified in ASTM Standards F355 and ASTM 1936. Should I Have my Field Tested? G-max performance will vary throughout the lifespan of a specific field. As a general rule of thumb, the G-max result will increase as a field ages meaning that users are more likely to sustain injuries on older fields. This is of course dependent upon factors such as the constructional make-up of a particular field, for example is a shockpad installed underneath the artificial grass. G-max consistency will also be largely affected by the level of maintenance being carried out to the field. Industry experts recommend that G-max testing should take place on an annual basis in order for facility operators to demonstrate their due diligence and commitment to the field users. Surface Performance are the only company to offer G-max testing contracts based upon annual testing carried out over a 5 year duration. Testing should always be carried out by an independent and accredited testing company with ISO 17025 accreditation. Gmax testing to ASTM F355A & ASTM F1936 allows facility operators and owners to demonstrate a proactive approach to due dilligence and safety. When testing is carried out by an ISO 17025 accredited independent company such as Surface Performance then the test reports can potentially help protect field owners from lawsuits in the case of injury. Test reports will also ascertain if any remedial action is required to be carried out on the field and therefore drastically reduce the risk of injury to users and players. Some artificial turf fields require an annual Gmax test in order to maintain the validation of the manufacturers surface warranty. If you would like a quotation for Gmax testing then please contact us using the contact form at the bottom of this page. Surface Performance Ltd offer cost effective Gmax testing throughout the USA & Canada. We have technicians strategically located across the country in order to ensure that we can provide clients with a competitive and fast service. Please fill in the form below and we will send you a formal quotation for Gmax testing.